In our fast-paced, urbanised world it’s easy to forget our connection to nature. 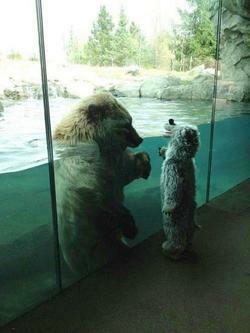 Yet, when we are children, we are more open to learning from our animal cousins. Who knows what knowledge we might glean about them – and about ourselves? ‘Born to Be Wild’ is an interactive street performance following the stories of Georgie and Sam as they discover their spirit animals after watching a wildlife documentary. The two children take the audience on a journey of discovery through the animal kingdom, learning to identify what special features make every creature unique, and in doing so, what is unique about each of us. Are you a protective bear, wise crow, or sneaky snake? Come along and meet your own beastly guide as Georgie and Sam come to understand the world around them, and their place in it. Part homage to David Attenborough, part physical comedy, ‘Born to Be Wild’ brings together the animal world with the human spirit through a child’s natural curiosity. Drawing on the traditions of many ancient cultures, this interactive show utilises simple games, physicality and play to explore what we can learn today from the concept of the spirit animal, our connection to nature, and celebrating it as part of our shared humanity. Take a walk on the wild side with Same Difference’s ‘Born to Be Wild’, the show that brings out the animal in all of us. 2 x 30 minute shows per day (over 6 hours). Perfect for families and especially good for children ages 8-12 years. ( 3 shows a day are available on request).